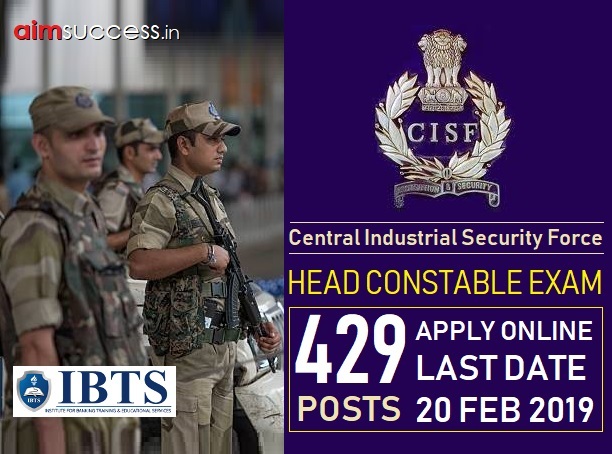 CISF Head Constable Exam 2019 - Apply Online for 429 Head Constable Posts in CISF, Across India on a Temporary Basis. Online Applications are invited by Central Industrial Security Force from 21 Jan 2019 to 20 Feb 2019 til 05:00 PM for 429 vacancies. Eligible candidates may apply online at CISF's website (direct link is given below) from 21 Jan 2019 to 20 Feb 2019 05:00 PM. If student have any query regarding CISF Head Constable Exam Coaching Exam 2019 Coaching & Selection Process than they leave comment below comment section as soon as possible we will reply your queries. You can connect with us on FB, Twitter, Instagram as well. Interact with your fellow aspirants about CISF Head Constable Exam Coaching 2019 in our discussion forum.